In the early moments of Tuesday’s playoff game, the Oklahoma City Thunder looked game to steal a road road win from the Portland Trail Blazers. Damian Lillard and C.J. McCollum put a quick end to those hopes. The Thunder were hot early and opened a 31-26 lead in the game’s opening quarter. But as time wore on, Portland’s backcourt duo took over and the Thunder had no answers in a 114-94 Trail Blazers win to secure a 2-0 series lead. McCollum led the way for Portland with 33 points while Lillard chipped in 29 of his own. And each of them found their way into the highlight reel with dueling buzzer beaters. McCollum’s 3-pointer as time wore down in the second quarter tied the game at 54. 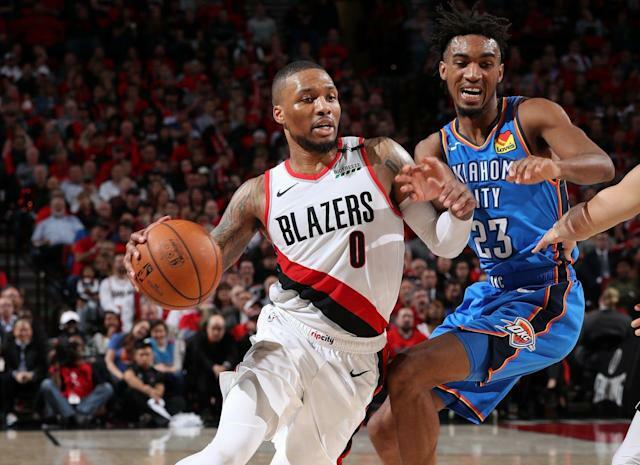 Lillard’s buzzer-beater to close the third quarter capped a dominant, decisive stanza that saw the Blazers outscore the Thunder 37-21 to put the once-close game well out of reach. As Portland caught fire, the Thunder went cold, missing on nine straight 3-pointers before a Paul George shot from the corner in the fourth quarter put an end to the drought. It’s the second straight game that Lillard and McCollum got the best of George and Thunder guard Russell Westbrook, a bad omen for the Thunder as they face a critical Game 3 at home on Friday. Portland was dialed in from distance, hitting 13-of-32 3-point attempts while shooting 46.7 percent from the floor. Lillard hit 4 of 8 from distance while McCollum went 3 for 7 and Seth Curry got in on the action from the bench hitting 3-of-4 3-pointers while tallying nine points. Oklahoma City, meanwhile, was a mess from the floor, connecting on 5-of-28 3-point attempts while shooting 40.7 percent from the field. George’s lingering sore right shoulder didn’t appear to be much of a problem on Tuesday in what can be seen as a lone bright spot for the Thunder. He tallied 27 points and eight rebounds on 11-of-20 shooting. It was a vast improvement over his 8-of-24 performance in Game 1 that raised concerns that he’s not physically right for the playoffs. But Westbrook’s longstanding jump-shooting struggles were in full force on Tuesday as he shot 5 of 20 from the field, including hitting just 1-of-6 3-pointers en route to 14 points to go with 11 assists and nine rebounds. The first two games of the series leave the Thunder searching for their identity as they head back to Oklahoma City. Aside from their offensive woes, this is a team that ranked fourth in the regular season in defensive efficiency. Nothing from Tuesday’s game resembled one of the league’s best defensive units. If Oklahoma City can’t find some adjustments at home, this could end up as a swift exit from the playoffs.